In an offseason characterized by inactivity and a wariness to trust anybody over 30, the Giants made waves by trading for both Evan Longoria and Andrew McCutchen, adding them to a lineup that last year already ranked as the NL’s oldest and least potent, even after park adjustment. So far, the gambit hasn’t paid off. On the heels of a forgettable 64-98 season, the team scoring a major-league-worst 2.88 runs per game has gone 6-10, scoring exactly one run in six of those games and being shut out three times. On Tuesday night, they were a measly Brandon Belt check swing against the shift away from being no-hit by the Diamondbacks’ Patrick Corbin. Though both Longoria and McCutchen have had their moments, neither has come anywhere close to living up to their billing. Though Madison Bumgarner’s dirtbike accident loomed large, the Giants’ 2017 season was forgettable in part because the holes that McCutchen and Longoria were brought in to fill weren’t fully addressed during the preceding winter, as the team chose to spend big on reliever Mark Melancon instead. Needing a third baseman after Matt Duffy was sent to the Rays in a 2016 deal for Matt Moore, the team brought in free agent Aaron Hill and Korean import Jae-Gyun Hwang. But the pair combined for just 75 PA at the position, somehow collecting only six hits and eight walks; Hill’s late-April forearm strain didn’t help, nor did injuries that pulled utilityman Eduardo Nunez to other positions. Between that trio, holdovers Conor Gillaspie and Kelby Tomlinson, rookie Christian Arroyo, prodigal son Pablo Sandoval… I could go on like this, but the 10 players whom the Giants used at third base in 2017 combined to “hit” .249/.309/.380, finishing dead last in the majors with an 83 wRC+ and -1.7 WAR, 1.4 wins lower than the second-worst team. Likewise, the losses of Angel Pagan and Gregor Blanco to free agency were dealt with by hoping that in-house solutions, including Gorkys Hernandez, Jarrett Parker, and Mac Williamson and could cover left field, but the results were just as grim: 13 players combining to hit .246/.299/.350 for an NL-worst 77 wRC+ and MLB-worst -0.9 WAR. Things weren’t a whole lot better in right field, where the aging and fragile Hunter Pence remained; the 10 players the team used there (including Pence for 75% of the PA) combined for 0.1 WAR. With three cylinders failing to fire, it’s no mystery why the 2017 Giants ranked second to last in the league in scoring (3.94 runs per game) and last in wRC+ (83). Just about any fix for those corner positions would have been an improvement, and in trading for both Longoria and McCutchen, the Giants did bring in star power, if not stars at their most powerful. The 32-year-old Longoria, acquired from the Rays in December along with $14.5 million in cash for Arroyo, center fielder Denard Span (another weak link in the 2017 lineup), and two pitching prospects, was coming off a .261/.313/.424 season with 20 homers and a career-low 96 wRC+, 26 points below his career average and 27 below his strong 2016 season. The 31-year-old McCutchen, acquired from the Pirates in January along with $2.5 million in cash in exchange for pitcher Kyle Crick, outfield prospect Bryan Reynolds, and $500,000 in international pool money, was a year removed from career worsts in wRC+ (105) and WAR (1.1), having hit .279/.363/.486 with 28 homers, a 122 wRC+, and 3.6 WAR. Through Tuesday’s games, Longoria (who sat out the one-hitter) is batting .204/.218/.407 for a 72 wRC+, with McCutchen hitting .194/.275/.323 for an 73 wRC+; each has two homers. McCutchen, after starting his Giants career in a 2-for-24 funk, put together the season’s first six-hit game on April 7. The capper was a walk-off, three-run homer in the 14th inning to defeat the already reeling Dodgers. Three days later, he hit a walk-off single against the Diamondbacks; he remains the only player with multiple walk-off hits this season. But since the homer, he’s gone just 4-for-31, albeit with six walks, compared to one in his first seven games. Longoria began his Giants career by going 0-for-17 before homering off the Mariners’ Marco Gonzales on April 3. Since then, he’s hitting a lopsided .286/.306/.514 in 36 PA. Both batters are hitting the ball hard, but too often on the ground. Thanks to those grounders, the pair have the Giant’s second- and third-largest negative gaps between their expected wOBA and actual wOBA (-73 points for McCutchen, 76 points for Longoria), and both are in the bottom third of the league in terms of BABIP (.227 for McCutchen, .265 for Longoria). Both players are swinging at rates that represent career highs. 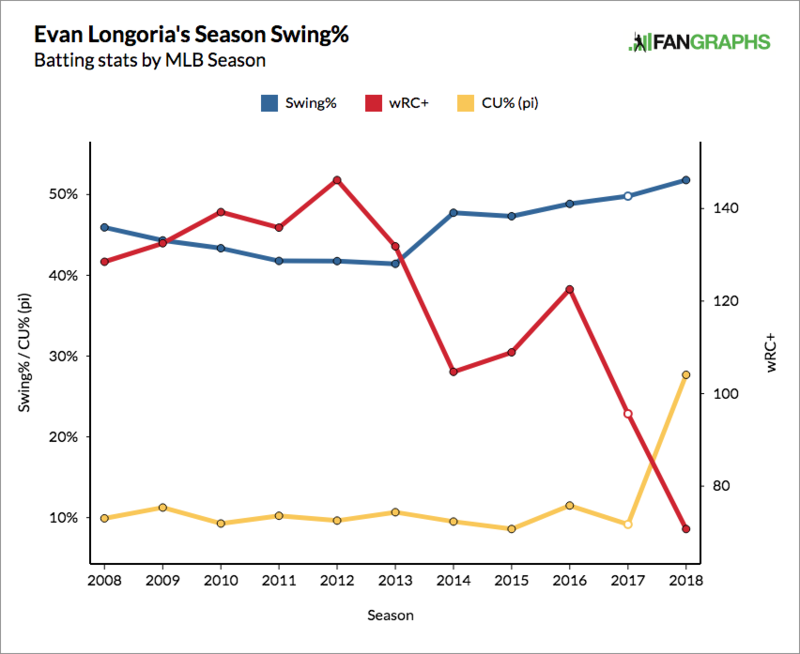 Longoria’s 51.8% swing rate is 6.3 points above his career mark, while McCutchen’s 46.9% rate is 3.3 points above his career mark. The latter is at least walking 10.1% of the time, but the former has walked just once while striking out 18 times. Longoria could stand to be more selective. Longoria’s swinging and missing a lot. The Giants’ one-run-or-die strategy worked great when their pitchers blanked the Dodgers while backed by Joe Panik’s solo homers in the season’s first two games, but predictably, the returns have diminished. Longoria and McCutchen aren’t the only culprits for the flagging offense, but Pence (12 wRC+, .189/.214/.208) and part-timer Austin Jackson (36 wRC+ on .227/.255/.250 hitting) are the only other Giants with at least 40 PA and a wRC+ below 90. If the team is to remain afloat in the NL West race until Bumgarner returns from his broken hand in late May, the new guys had better step up. We hoped you liked reading Not-So-Fresh Starts in San Francisco by Jay Jaffe! In 23 years, the first 6-hit game for the Giants? Or do you mean 6+ hit, in which Crawford’s 8-hit game a few years ago should count. Or do you mean, for the first time in in 23 years the Giants had the league’s first 6-hit game? I enjoy meaningless (and slightly meaningful) stats, but here I’m slightly confused.